SIN. It has the potential to bring EVERYTHING down. The good news, is, that’s what the Gospel is all about. The Father wants to STOP SIN and that is why He sent His Son to cancel its debt on the cross and in His resurrection provide the power we need to live a godly life. I want to thank ALL of you who have been praying for Don Daniel. It’s with a heavy heart that I write these words. Don went to heaven this morning. His absence leaves a horrible vacuum. Don had been suffering with a sudden illness. I had cried out to our Father to raise Him up! I believed. But, this morning, though our cry was not answered as we had hoped, I DO praise the Lord – because Don has been RAISED UP and lives in the King’s presence! Don is with the great patriarch’s of the faith. He has seen the face of Jesus! He is in glory. And, the Lord knows how we all terribly miss him. Please keep his beautiful wife Joby, and the entire Daniel family, in your prayers. We will be gathering together on Thursday, May 7th at 11:00 a.m. at Calvary Auburn, to give thanks to God for Don Daniel, and to stand with the Daniel family at this time. Below are scriptures that I thought you would also be blessed by. Grace was DEMONSTRATED in Jesus: John 1:14 14And the Word became flesh and dwelt among us, and we beheld His glory, the glory as of the only begotten of the Father, full of grace and truth. Okay church family, here is the, “church homework”, for this week. Let’s see what the Lord will do in our lives in growing us to discern His voice!! “True” is that you are EMPOWERED (Acts 1:8, Ephesians 1:23, John 16:7). “True” is that you are PURPOSED (Acts 1:8, Romans 10:14, 2 Timothy 4:2). “True” is that you are COMPLETED (Romans 8:29-30). “True” is that you are FORGIVEN (1 John 1:9, 2 Corinthians 5:21, John 19:30). “True” is that you are FREED (Romans 8:10-11). “True” is that you are ENSURED “success” (Isaiah 55:11, Galatians 6:8-9; 2 Corinthians 9:6, 1 Corinthians 3:5-8). “True” is that you are COMMITTED to. “I am with you always, even to the end of the age” (Matthew 28:20). “Let your conduct be without covetousness; be content with such things as you have. For He Himself has said, “I will never leave you nor forsake you” (Hebrews 13:5). “True” is that you are STRONG in Christ (2 Corinthians 12:7-10). I want to THANK THE CHURCH FAMILY for YOUR PRAYERS for myself and MY FAMILY at this time. This last Sunday, the Lord totally blessed our services, and then Stephanie and I, along with Pete and Lily, hopped in the car for a LONG drive to Yakima, Washington, to attend the memorial service for Stephanie’s grandmother. It was a wonderful time with family — and a wonderful time of celebration that grandma McCormick was in HEAVEN with the Lord! Last Saturday, our son, Greg – came down with a fever in the morning — yet went to practice and played a tough full contact scrimmage at UC Davis. I was so proud of his effort! However, the next day, he was hit in a different way, with a SERIOUS bout of pneumonia that left him with high fevers and sicker than he has ever been in his life. We’d deeply appreciate your prayers for him as he’s on the mend, and trying at the same time to balance school responsibilities, and spring football. And, also, please pray for Don Daniel – a precious brother in our church, and a dear personal friend, who is battling a SERIOUS infection and is in ICU! I will be visiting him this evening. 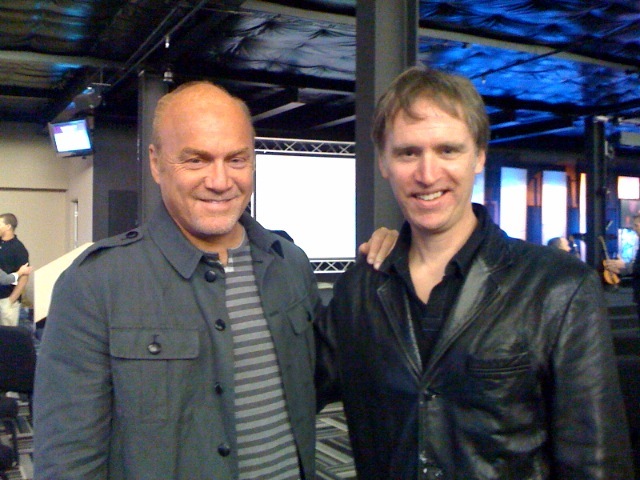 Thursday I traveled to southern California for a meeting and attended Greg Laurie’s Bible study in Irvine, Ca. It was a GREAT Bible study and I was so refreshed by the Word of God. And it was so wonderful seeing MANY pray to receive Christ! It was also great to have Sarah with me who came from Bible College. Friday we had lunch with pastor Greg which was such a great time of fellowship and inspiration. Please continue to pray for pastor Greg and his beautiful family as they are mourning the absence of their first born son, Christopher – AND, as he prepares for a crusade this month in South Dakota! After lunch, Sarah and I met with my good friend, pastor Steve Wilburn of Harvest Christian fellowship to discuss Steve coming to our church as a guest speaker Sunday, June 21st which I know the whole church will so enjoy! Speaking of Sarah, please pray for her, too, as she will be singing two songs Sunday night at Harvest Christian Fellowship. May the Lord JESUS be glorified and may the songs Sarah sings help prepare for the message that pastor Steve will give as he opens the Scriptures that evening. I have been thinking about what the “early church” looked like at this time nearly two thousand years ago. What was happening in their lives? Today, we’re just a few days after NISAN 17, the day Jesus rose from the dead. If we were living at this time, nearly two thousand years ago, we would be amidst what Acts 1:3 identifies as the forty day period in which Jesus showed Himself alive — risen from the dead! Eventually, on Pentecost (fifty days after resurrection), 3,000 Jews turned to Jesus as Savior and Lord and were baptized in Jerusalem. Then what happened? What did the early church look like, the church now made up of thousands of people? What were they doing? Acts 2:42 tells us that they “CONTINUED in the apostles doctrine!” The early church was learning the Scriptures! They were continuing in the Word of God. The Bible records that God spoke to man over four thousand times! If this is true, then inherently the Bible is of the highest and greatest authority. After all, “if God has said it then that settles it.” And if God has spoken to man only a fool would not listen, right? But the main reason the Bible can be trusted is not because men of renown have testified of the Bible’s authority. We know the Bible is true because Jesus said it is. There is no greater authority than Jesus, who demonstrated He is the Son of God by resurrecting from the grave. Put another way, the Bible is not infallible because it says it is – but because Jesus says it is! In one statement Jesus authenticated the threefold division of the old testament – the law, the writings, and the prophets – as the Word of God, saying, “These are the words, which I spoke to you, while I was yet with you, that all things must be fulfilled, which were written in the law of Moses, and in the prophets, and in the psalms concerning Me” (Luke 24:4). Let’s “continue” in the commitment to the Word of God in OUR generation! This is a recent picture of Greg Laurie and myself taken in Orange County the first night of his OC Bible study. Needless to say, Greg has been a HUGE mentor to me and a DEAR friend.